ALBUQUERQUE, N.M. (AP) — A New Mexico archbishop is renewing his call for Catholics to stop worshipping the skeleton folk saint known as La Santa Muerte, or “Our Lady of Holy Death,” saying he fears some mistakenly believe the Grim Reaper-like figure is a Roman Catholic Church-sanctioned saint. Santa Fe Archbishop John Wester recently told The Associated Press he believes some Catholics may be fooled into venerating Santa Muerte even though the focus on death runs counter to the church’s teachings. But the devotion to death is not in line with the church’s teachings, Wester said, and Santa Muerte is misleading to people. “Our devotion is to the God of life,” Wester said. Popular in Mexico and sometimes linked to drug cartels, La Santa Muerte in recent years has found a diverse following north of the border: immigrant small-business owners, artists, gay activists and the poor, among others — many of them non-Latinos and not all involved with organized religion. Shrines and statues of the skeleton figure — typically depicted wearing a black nun’s robe and holding a scythe — can be found in New Mexico, California, Louisiana, Texas and elsewhere. Sis said La Santa Muerte is “spiritually dangerous” and has no link to Catholicism. “It should be completely avoided. It is a perversion of devotion to the saints,” Sis said. But so far no other high-ranking Catholic church officials have publicly criticized the worshipping of Santa Muerte, according to Andrew Chesnut, author of “Devoted to Death: Santa Muerte, the Skeleton Saint” and Bishop Walter F. Sullivan chair in Catholic studies at Virginia Commonwealth University. 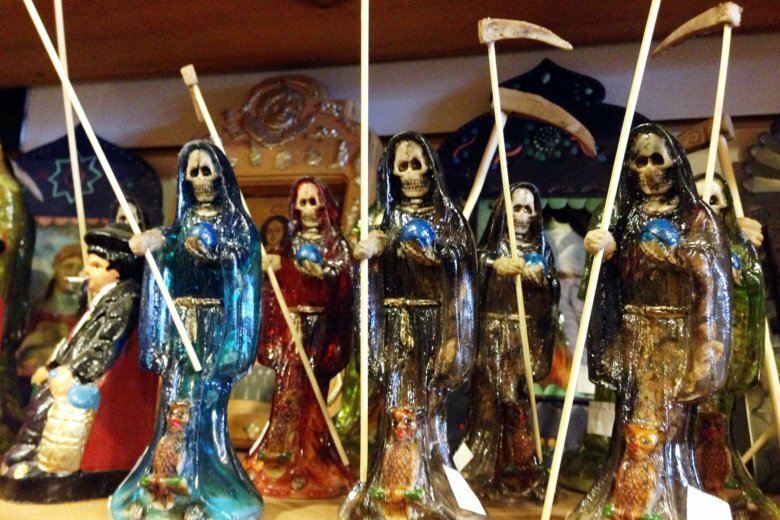 “In Latin America, church officials rebuke Santa Muerte almost weekly,” Chesnut said.